The mammogram debate was revived last month when the U.S. Preventive Services Task Force, an independent panel of experts appointed by the federal Department of Health and Human Services, recommended that women at average risk start mammograms at age 50, not 40, and get them every other year, not every year. Mammography remains the most common method for early detection of breast cancer. 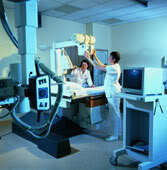 A mammogram is an x-ray picture of the breast that can reveal tumor growths otherwise undetectable in a physical exam. Like all x-rays, mammograms use doses of ionizing radiation to create this image. Patients are often wrong about the radiation risk. The effective radiation dose from a mammogram is about 0.7 milliSievert (mSv), which is about the same as the average a person receives from background radiation in 4 months. Background radiation is the radiation found in our natural environment. For example, most flight crews receive annual effective cosmic radiation doses from the sun and outer space in the range of 2 to 5 mSv. In the same manner, it has also been shown that the inhabitants of granite houses in Aberdeen, in Scotland, might receive about 20% more radiations than those in brick houses in Leeds, and that people living in the chalk areas of the south of England might get 20% less. Detractors of the mammogram also often present false negatives and false positives as major limitations. Despite today’s highly sophisticated mammography equipment, there is always a chance to fail to pick up the presence of an existing cancer (false negative). And researchers have found that breast tissue is denser among younger women, making it difficult to detect tumors, making false negatives twice as likely to occur in premenopausal mammograms. Similarly, false positives, when mammograms present abnormal results but no cancer is actually present, can lead to unnecessary biopsies and can be emotionally draining for the patient. Still, with screenings, we can’t have both ways! If we reduce the chances of false positives, the more false negatives we have, and vice versa. age 40. Statistics also show that mammograms reduce breast cancer deaths by about 15% in women in their 40s. Critics argue that you’d have to screen more than 1,900 women over a decade to save one life. Still, if that’s your life, isn’t it worth it? Dr. Susan Jamieson follows the standard western guidelines and recommends for women at average risk a yearly mammogram when over 50, and every 2-3 years between 40 and 50. -personal history; women who have had breast cancer are more likely to develop a second breast cancer. -family history; the risk increases in the case of a close relative having been diagnosed with breast or ovarian cancer. -History of fibrocystic breast disease. -Prolonged use of oral contraceptive pill, especially when started before the age of 18. Regardless of your current age or what you decide about mammograms, be sure to get an annual check-up and clinical breast exam. Please do not hesitate to discuss your case with Dr. Susan Jamieson. Contact Holistic Central at 2523-8044 to book an appointment.